In the world of low cost, canned (tinned), brand-name tobacco, there is probably no more tasty and sophisticated tobacco than McClintock Virginia. We have tried just about everything on the planet and have yet to find a low cost alternative in this category that can match it. Made by Peter Stokkebye, it is very smooth and mild, lots of flavor, without the "tang" of most low cost tobacco, and available at most online outlets. Prices may vary so shop around. 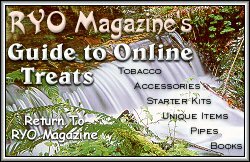 The best prices we have found online as of this guide's date are in the $7 to $8 range for a 7 ounce tin and are at RYO Tobacco (www.ryotobacco.com) and ABS Tobacco ( http://abstobaccoshop.safeshopper.com ). If that smoking enthusiast you know has been looking for a low cost alternative to higher priced pouch tobaccos, we are confident this one will be a hit. For a somewhat more costly and classy offering, we recommend any one of the three Peter Stokkebye Shags. These tobaccos are about as good as it gets. Our favorite is the Danish Export # 91 available at ABS Tobacco ( http://abstobaccoshop.safeshopper.com ) for about $14. For a bit stronger experience, the other Stokkebye's (Norwegian #90 and Amsterdam #93) are a great buy at both Ziggy's and Carey's Smoke Shop ( www.smokecheap.com ). These are all 10.6 ounce tins. Cascade Cigar and Tobacco (www.cascadecigar.com) has these blends in bulk pricing for those who do not need the tin and ABS Tobacco has consistently led the way in low pricing on this incredible product. Pouch tobaccos can be great introductions for the RYO smoker in the under $5 category and there are many to choose from that have unique characters. Some of the best and most common at tobacco outlets are Bali Shag (red and blue) Samson (red and blue), Jester, Drum (which is outstanding and available lots of places), Chill's Americana, Gauloise (Caporal and their exciting new Halfzware). Any one of these would be a nice treat for the RYO smoker who has yet to try them and many shops put these on sale at low prices to get customers to experiment with different brands. Shop around. 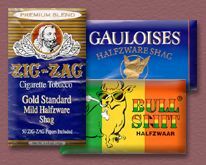 For instance Zig-Zag's Halfzware Gold Standard (www.zigzag.com) which is available at most general merchandise store's tobacco sections and is probably the easiest to find, is really wonderful tobacco. For a more unusual treat with a real punch, try Bull Snit (yes, that's SNIT) available at various tobacco shops. Bulk tobaccos, though not as prettily packaged, make great economical choices for the RYO smoker. Three locations online stand out as having the largest variety of bulk blends. 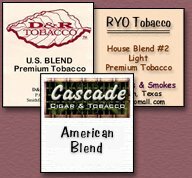 D&R Tobacco (www.cigarettetobacco.com), Cascade Cigar & Tobacco (www.cascadecigar.com), and RYO Tobacco ( www.ryotobacco.com ). Our picks from these great shops are D&R's U.S. Blend and Ramback Turkish, Cascade's American Blend and Turkish Blend, and RYO's House Blend # 2 and Sagamore. All made this section's best buy category meaning that they are all reasonably priced great tobaccos and well worth the experience. And finally, of course, how could we fail to mention perhaps the best deal in roll your own tobacco on the web. The five (5) pound tub from RYO Tobacco (www.ryotobacco.com). This is outstanding tobacco with a mild Turkish character. As a final reminder, remember, you are responsible for state and local taxes if you buy tobacco from outside of your state. Ask the vendor if the tax for your state is included in the price you are paying (in most cases it is not) and while enforcement has not reached a critical level as yet, the time may come when you will be asked to pay that tax retroactively. Check your local and state laws for more information or your state's department of revenue and remember you must be at least 18 years of age to purchase tobacco products.